Last week, my husband and I were invited to a Saturday wedding three days before the event. Apparently, quite a few guests backed out of coming and the caterer's payment was non-refundable, hence the last-minute invite. Even though we were just glorified seat fillers, I still wanted to take a small gift, some sort of keepsake. I originally intended to etch the couple's monogram on a set of wine and martini glasses that I had on hand, but was promptly informed by my sister that the couple does not drink (--like, at all). 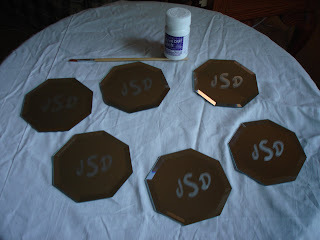 So, after a trip to wander around Hobby Lobby, I ended up with six octagonal, beveled craft mirrors (half price this week!) and a small jar of etching cream. 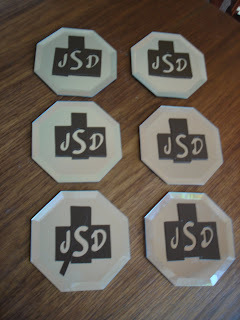 Conveniently, the mirrors already had protective felt pads on their undersides, so a set of six mirrored, monogrammed coasters was my goal. I used my Cricut to cut the couple's monogram out of some leftover vinyl I had on hand. Cricut also sells vinyl cut to size for their cutting machines, but it is rather pricey. Alternatively, you could use letter stencils to trace the monogram onto contact paper (or just freehand them if you are feeling especially artistic). It is very important to make sure your glass objects are clean before you apply your letters/cutouts! I decided to have just the letters frosted, so I applied the vinyl surrounding the cutout to my glass, leaving the actual letter out. You could also have the entire surface etched with just the letters left clear, in which case you would apply the actual individual letters to the glass and spread the etching cream around them, covering the entire surface. Make sure to smoothe out all of the edges so no etching cream gets under your stencil (any glass that comes in contact with the cream will be etched). Etching cream is typically comprised of flouride compounds that alter the glass after contact (according to Wikipedia). Pay attention to the manufacturer warnings on the cream you buy because it can irritate skin, eyes, etc. I used a small paintbrush to apply the etching cream to the letter "spaces," making sure to apply it rather thickly, filling in each letter completely. The particular brand of cream I bought needed to sit for a full five minutes before being rinsed off. I also cleaned the glass again with a streak-free glass cleaner once it was rinsed. When you do rinse the cream off, it will look like there is no etching. Don't worry! Once the glass is dry the etching will be more apparent. Note: I bought the smallest container of etching cream available, and although it seems rather expensive I only used a very small fraction of the bottle. That tiny container will last for many projects to come. Don't be sticker shocked. Also, even though this was just a small, inexpensive project, this idea definitely lends itself to more ambitious pieces. I'm thinking of large hurricanes for the holidays with Christmas-themed phrases/pictures. There are definitely a multitude of possibilities using this technique. Be creative and enjoy!